Cherry and White Chocolate "Perfect Pound Cake"
Back in the United States! I have a new go-to method to cooking fresh green beans. When I was in France, one of our students (who refused to eat vegetables) had a roommate who could cook green beans in a way that she loved. I was intrigued, so asked the roommate for her recipe. It turned out not to be so much a recipe with measurements, but more of a method, and my version of the recipe has become a regular in our household. It's an excellent side for almost any meal, not just those with Asian flavors, and may just convert the vegetable-challenged in your household! Heat the olive oil over medium heat. Add the garlic, ginger and red pepper flakes and cook until softened, but not browned. Add the green beans and stir to coat with the oil. Add some soy sauce (start with just a little bit, maybe a tablespoon, and add more as needed for taste). Cook while stirring periodically, adding a little water or white wine if the soy sauce starts to evaporate. (You want to end up with a little bit of "sauce" at the end.) Cover the pan and stir occasionally until the green beans are cooked, but still have a crunch to them, about 5-10 minutes. Serve hot. I love Asian flavors and this sounds fabulous. It's amazing what a little ginger and soy sauce can do. 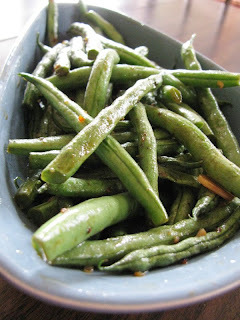 These green beans sound wonderful - they remind me of one of my favorite Chinese buffet dishes! I have a some green beans in my fridge .. well this is my lunch recipe. Thank you! I found you through Google. This recipe was excellent! I'll definitely be making it again. This sounds delicious and very simple. Similar to a Chinese bean dish I used to eat in Hong Kong although in that recipe there was minced pork. These asian green beans tastes deliciou, what a great selection! These Asian green beans tastes delicious, what a great selection!